This morning I did something completely out of the ordinary. I took a break. After working nearly eighty hour work weeks for the last month (or three? They all seem to blur together), I haven't had much free time. I truly enjoy what I do at each job but, at the end of the day, there is such a thing as too much of a good thing. Or really, just too much. Though the end of this madness is in sight (hurry up January! ), there is still another month of workaholic tendencies to attend to. Today, however, I found myself with an entire morning with blissfully nothing to do. Four hours. Four hours doing absolutely nothing. It was a beautiful, beautiful morning. Truth be told, I'm not used to having free time so it took me a moment to fully settle into my lazy groove. I caught up on Gossip Girl, my favorite guilty pleasure, while eating up the last of the leftover Honey Cinnamon Roasted Chickpeas from Thanksgiving (these are so addictive!). When I had my fill of television, I took out the arts and crafts. Last Christmas I received a card making kit and for some reason I never got around to putting them together. So I put on a little Ella Fitzgerald, brought out the scissors and glue, and got to work. This was on track to be one of the best mornings in a long time, except for one minor detail. Can you guess what was missing? Chips and soda, people. Chips and soda. I almost never eat chips or drink soda. Since my life tends to often be consumed by sweets (if this blog and the fact that I work in a bakery weren't enough of a hint already), I often try to eat as healthy as I can at home. While this means I occasionally snack on chips or soda instead of apple slices or water, I never eat or drink both at the same time. This morning, however, was a special occasion. There were chips and soda, cards and crafts, and enough of these Pumpkin Chocolate Granola Bars to round out a meal called lunch. What guilty pleasures do you like to indulge in when you have free time? These Pumpkin Chocolate Granola Bars are a spin-off of the Pumpkin Granola I made earlier this autumn. 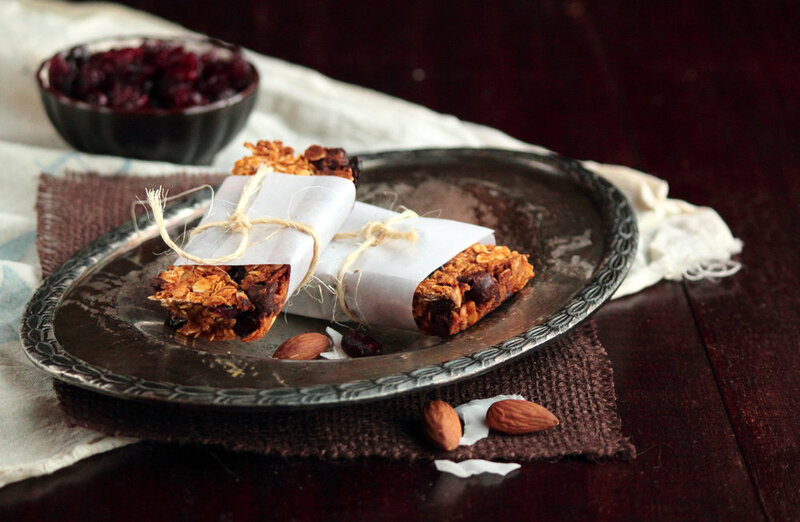 These bars feature pumpkin, chocolate chips, almonds, dried cranberries, and flaked coconut, though you could certainly play around with ingredients to adapt the bars to your personal taste. Most of the sweetness in the bars comes from the chocolate chips and, without any butter or oil, they are even good for you. These granola bars make for a healthy snack or a quick breakfast on the go. Preheat oven to 350 degrees F (180 degrees C). Grease an 8x8-inch baking pan (or pan of equivalent area). In a large bowl, mix together the pumpkin puree, applesauce, cinnamon, nutmeg, ginger, and salt. Stir in the brown sugar, maple syrup, and vanilla extract until smooth. Add the oats, dried cranberries, chocolate chips, almonds, and coconut, stirring until granola is evenly coated. It will be moist. Press granola firmly down in baking pan. Bake for 35-40 minutes, or until lightly browned and no longer moist to the touch. Allow to cool completely before turning out on a cutting board. You must allow the granola to cool completely or the bars will fall apart (a refrigerator can speed up the process). Cut granola bars into desired size (I ended up with 8 2x4-inch bars). Wrap in parchment paper to make quick grab-and-go snacks. Store in an air-tight container to keep fresh.